Women’s labour is undervalued. Few could argue with that statement: the evidence is available anecdotally in our day to day lives, in the types of work available to women across the globe, and in the pay and remuneration women receive for their labour. Statistically, it’s undeniable: wherever a labour market exists, a gender pay gap is evident. Speaking at the IAFFE, Nuria Molina and Kasia Staswezska pointed out that globally, the cost of the gender pay gap is $17trillion: comparable to the combined gross domestic product of France, the United Kingdom, and Germany. But focussing on paid labour overlooks the problem of care in attempts to widen and improve women’s economic empowerment globally. 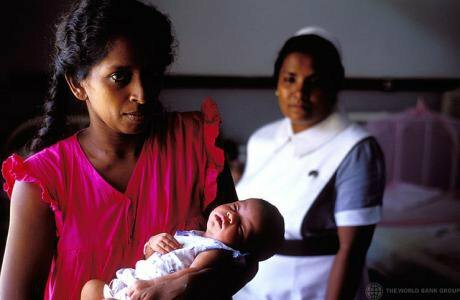 Priya Raghavan argues that addressing heavy and unequal care is the only way of achieving more economic justice for women. While women carry out more housework and more childcare, economic empowerment often means that paid labour is taken on in addition to the heavy burden of care work in the home. Gender inequality even affects sleep, when it comes to work. Due to care burdens, women sleep less than men even when they are not participating in paid work, an ActionAid report into households in ten developing countries showed. Oxfam found that in the six countries they surveyed, when combining paid work, and unpaid care work, women worked for more hours than men in every country. 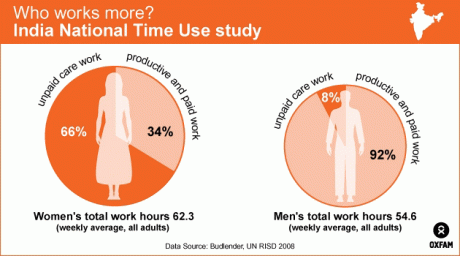 So while unpaid care and work is undervalued, it also encroaches on women’s leisure, and rest, and therefore health. But care burdens can violate women’s human rights, specifically the right to enjoy the benefits of scientific progress, the right to participation in civic life, and the right to rest and leisure. Women’s economic empowerment is not simply about labour force participation: it must also encompass and consider choice to work, choice of sector, location and working hours. When working for women’s economic empowerment, societies, politicians and development workers need to make sure women’s economic empowerment doesn’t come at the cost of time poverty: leisure and rest are just as important. For instance, introducing low-cost fuel-efficient stoves, washing machines and improving access to safe water reduces the time women spend on unpaid labour and care work, because the tasks are completed more efficiently, in a shorter space of time, freeing women’s time and allowing more space for leisure, rest, or entry into the paid workforce. Conversely, some studies have found that introducing electricity into homes often has the opposite effect: with the period in which work can be undertaken expanding, work grows to fill the time, rather than allowing tasks to be performed in a shorter period. Technology alone cannot be a liberator without an attendant change in social attitudes towards unpaid work and a shift in the gender burden of work. The question “who performs the drudgery?” in society is a gendered one, but one that cannot be considered without looking at intrinsic class and race factors. Care workers, low paid health assistants, cleaners and child minders in society are predominantly women, but also working class, and often black or asian, globally. When theorists of contemporary global justice focus intently on income inequality without considering the colonial legacy’s impact on inequality, five centuries of oppression are ignored when seeking to understand modernity. To imagine that the colonial period is purely of the past, and that there is no economic, social and political hangover is to deny reality. The experience of migrant workers, and migration patterns globally prove this to be a falsehood. This illustrates the colonial hangover in our attitude towards care and “drudgery”: thousands of professionals, especially in medicine, still migrate from the global south to work in caring professions in the West. Without migrant workers, the National Health Service in the UK would collapse - health workers simply aren’t being trained fast enough to cope with demand. Meanwhile, a “brain drain” or “care drain” continues to affect the global south. Tronto notes that Africa trains 3% of the world’s physicians, but shoulders 24% of the world’s “disease burden”. The world is already short of four million health care workers, many of whom train in the global south, then migrate to the North. That this is rarely considered, speaks of the continuing subconscious mindset of colonialism - that accepting the fact so many people migrate from developing countries to perform the “drudgery” work is only socially palatable if we attach different worths to human lives, based on nationality, gender and economic position. The neoliberal attachment to capital as a measure of human worth and value only bolsters this mindset, and so further entrenches women’s position as the underclass in society.